Last night, I had the pleasure of training with Augusto Ferrari, who dropped by my gym to do a little workshop. 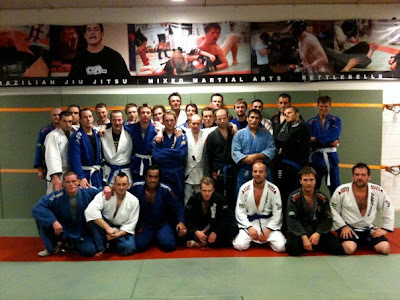 He was teaching 90 minutes no-gi and 90 minutes gi. I really enjoyed the training and liked his game a lot. He was all about base and pressure. I especially liked his guardpassing game which was almost identical to what Martin Aedma showed me in Estonia. Crazy pressure and balance, it was impossible to sweep him in any direction. Another thing I really liked, was how he opened up his game when he was sparring. Although I felt he could crush me anytime, he was rolling very light and fluid, giving me some openings here and there instead of just closing me down. 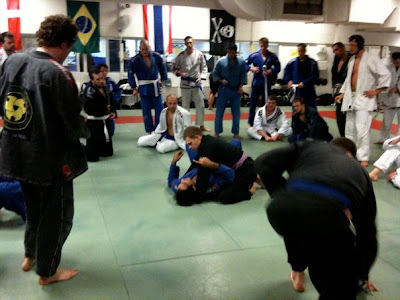 Awesome sparring with a very impressive grappler. Very cool sport i would really like to try it i think its all about themental strength to know how to take down your opponent. I has heard this name before...but I can't remember it very well now, has bee so long time since I trained kung fu, and I was in the world of martial arts.